Is there such a thing as the perfect peanut butter? Here are some standout jars handpicked by the experts in the food industry. Even though peanut allergies have sparked a surge in alternative nut butters, there’s never been more variety when it comes to your PB&J’s better half. Just look at how diverse the peanut butter aisle is becoming. (And if you’re game for alternative seed butters, the options are even more overwhelming.) What makes choosing the right peanut butter even harder is the fact it dances a fine line between health food and high in fat. Plus there’s always the question of added sugar. How important is that 1 gram of added sugar that separates most traditional no-stir peanut butters from their counterparts with only naturally occurring sugars? If you’re looking for a healthier peanut butter (or simply want affirmation that your favorite brand is truly the best) here are 10 expert-recommended spreads to consider adding to your shopping list. After TODAY Food polled dozens of nutritionists and chefs on their favorite peanut butter, Crazy Richard’s was the most popular answer. 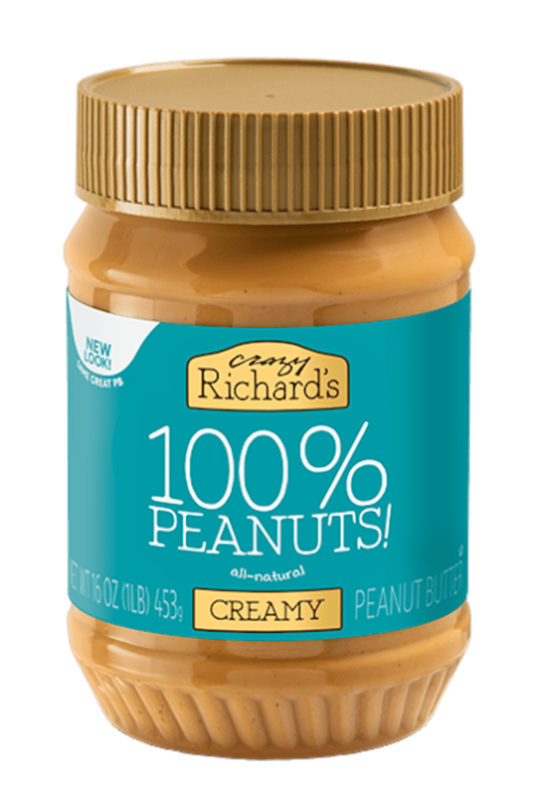 Available at Walmart, Jet and specialty grocery stores, a 2 tablespoon serving of Crazy Richard’s has 190 calories, 8 grams of protein, 16 grams of fat and 2 grams of sugar — the average amount of sugar per serving for peanut butters only containing naturally occurring sugars. Most traditional peanut butters, however, have an additional gram of sugar. That’s because they include palm oil and a little added sugar for sweetness, which also prevents the peanut oil from floating to the top of the jar (and makes them easier to bake with). “One gram of sugar has only 4 calories compared to the 190 calories in a serving of peanut butter,” Lauren Harris-Pincus, MS, RDN, (who also happens to be a Crazy Richard’s fan) told TODAY Food. “It’s so insignificant that I don’t think anyone has reason to worry about it.” The author of “The Protein-Packed Breakfast Club” is more concerned about the saturated fat from added oils in no-stir varieties. Find the original posting on Today.com HERE.